That really resonates with my work on the WorkHuman project with the Globoforce folks. The report, published in January, analyzes a survey conducted by Harris Interactive among 2,026 adults over 17 years old in the United States. Here’s an interesting data point that may interest you: nearly two-thirds (63%) of U.S. employees report that they ever work virtually. Surprised? I was. Given the heated discussions about the lack of workplace flexibility and work/life integration, that’s a lot of people with at least some flexibility. And over two-thirds of those folks think their management needs to communicate better in order to keep them engaged. The message seems clear – flexibility to work from home isn’t enough for employees. They still need to feel the love from their bosses. In fact, working from home requires managers to do more to keep their employees feeling engaged and that they have a human, real relationship with the organization, their work, and their boss. Certainly not rocket science. But a good reminder that the big challenge isn’t finding the right technology to enable more flexible work arrangements. The big challenge is keeping the humanity flowing when employees are isolated from their colleagues and bosses. Here’s a thought: maybe Marissa Mayer wasn’t crazy after all! How would you describe flexible scheduling? Does a standard definition come to mind? In a new SHRM survey on FWAs (flexible work arrangements), which surveyed 525 HR professionals from a randomly selected sample of SHRM’s membership, “FWAs,” “flextime,” “workplace flexibility,” “flexible scheduling,” etc. are defined under the following definition: “… a dynamic partnership between employers and employees that defines how, when and where work gets done in ways that work for everyone involved (including families, clients and other stakeholders).” This seems a definition with an interesting amount of ambiguity to describe a practice that ultimately, is extremely different from company to company. For organizations that responded as offering FWAs, 54% offered sabbaticals, 51% offered paid time-off for volunteer work, and 46% offered part-time/reduced hour schedules on a formal basis. Other FWAs were more likely to be offered informally. Additionally, among organizations that reported offering FWA’s, more than 50% responded that the following FWAs were available to “all or most employees”: paid time-off for volunteer work (82%), unpaid time off for volunteer work (72%), break arrangements (61%) a part-time transition after a major life event (58%) and flex time with “core hours” (54%). Fourth-fifths of responding organizations reported that 13 out of 17 FWAs were somewhat or very successful (80%-90%). The four FWAs that responding organizations reported finding less successful were unpaid time off for volunteer work (78%), phased retirement (74%), shift arrangements (73%), and sabbaticals (66%). Despite the availability of FWAs at responding organizations (both successful and less successful FWAs), the majority of organizations were likely to report that only 1%-25% of their eligible workforce used each of the FWAs offered. SHRM’s data highlights not only the rise of FWAs within organizations but that they are an increasingly desired organizational practice amongst employees. 32% of responding organizations indicated that requests for FWAs at their organization had increased in the past 12 months, while only 3% indicated those requests had decreased. 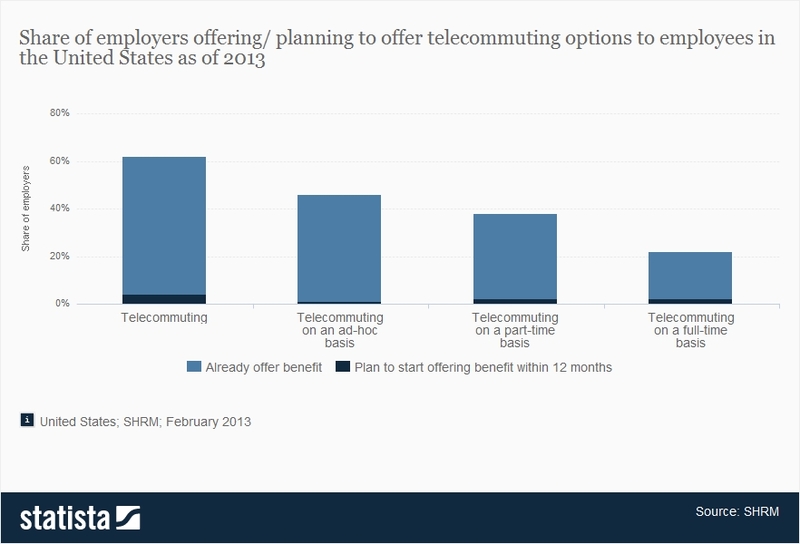 SHRM’s data also indicates that telecommuting as an FWA option offers potential increases in employee productivity. Of the 39% of responding organizations that indicated they offered employees the option to telecommute, one-quarter indicated the productivity of employees who were previously 100% onsite increased, and one-third indicated absenteeism rates had decreased. When SHRM asked organizations about changes in FWAs and telecommuting over the next five years, the overwhelming majority of organizations stated it was somewhat or very likely that FWAs (89%) and telecommuting (83%) would be more commonplace in five years. Nearly half (48%) of these organizations stated it was somewhat or very likely that FWAs would be available to a larger proportion of their organization’s workforce in five years, while 39% indicated it was somewhat or very likely that a larger proportion of their organization’s workforce would be telecommuting. SHRM’s FWA survey points to a number of important take-aways for organizations’ flexible scheduling policies, such as the reported positive impact of FWAs on productivity, job satisfaction, retention and employee health. This indicates that more organizations could benefit from offering FWAs, and those that already offer these options may find themselves with a competitive advantage. Despite the positive outcomes of flexible work arrangements, SHRM’s survey also highlights the low level of utilization by many employees. Organizations should make sure the decision to not partake in FWAs does not stem from job security fears, or culture perceptions that may make using FWAs seem like career limiting moves. Managers must remember that as employees are most likely to learn about FWAs on the job, their role is vital to the success of FWA programs. HR needs to ensure that managers are aware of all available FWA options, have proper training on how to inform employees about FWAs, and that they “practice what they preach” by utilizing such programs themselves. A New Voice Demanding Flexibility: Dads! The Working Mother Research Institute (WMRI), in partnership with Ernst & Young, recently released a report aimed at better understanding “how men are navigating the flexible work and home terrain.” Data from How Men Flex, The Working Mother Report is the result of survey responses from 2,000 men and women (evenly split) with questions aimed at understanding the impact of flexible work arrangements on their lives. While the impression may be that flexible work arrangements are greater utilized by female employees, WMRI’s data indicates that flexibility in the work environment is both used and desired by men and women equally. 77% of men report having flexible schedules and 79% state that they feel comfortable using such flexibility. Additionally, 62% of men state that their employers can and do support flexible scheduling. What’s also clear from WMRI’s data is that working mothers aren’t the only people struggling to with balancing work and family. 26% of men report that their employers could encourage flexible scheduling but don’t. WMRI notes that in recent studies both working mothers and working fathers, have almost equally agreed that they feel stressed about meeting their responsibilities in both their work and home environments. Studies have also shown that men are increasingly involved in the balancing act of family and work, something that’s often seen exclusively as a working mother’s issue. WMRI highlights a 2011 report, which showed that fathers spent 7 hours a week on childcare and 10 hours a week on housework, a significant increase from a 1965 study that reported fathers spent 2.5 hours a week on childcare and 4 hours on house work. The above graph highlights changing perceptions when it comes to work and family; 88% of men report that mothers and fathers should share equally in caring for their children and 83% report that household work should be shared equally as well. Organizations should make sure there is an inclusive focus on flexible scheduling not only because family management is a shared responsibility but also because flexible scheduling benefits employers in several ways. The data show that men with access to flexible scheduling are more likely to say they are happy, productive, have high have morale, good relationships with co-workers, and are overall more satisfied with their job than men without access to flexible scheduling. Employers who do not provide flexible scheduling lose a valuable tool for attracting talent and could be increasing their risk of losing valuable talent they do have. Right out the door, 54% of working fathers and 47% of men without kids state that they would reject a job with frequent travel due to obligations at home. What flex options should employers provide? While that depends largely on each organization’s professional needs (and their employees’ personal needs) men surveyed for WMRI’s report state that two days of telecommuting each week work best for them. These respondents report higher levels of satisfaction on almost all fronts compared to those who never work from home. Men who commute two days a week also report higher levels of satisfaction than those who work from home three to five days a week. WMRI’s report also finds that 6 in 10 working dads would work part-time if they could still enjoy a satisfying career; however, 36% of working dads say part-time work is looked down upon at their organizations. Working fathers, like working mothers, also report difficulty in managing boundaries around work, with 46% reporting that their job bleeds into their personal time, compared to 32% of men without children. The data here suggest that flexible scheduling options are just as valuable for men as they are for women, and, moreover, are an area that many organizations are unintentionally neglecting to make as accessible to male employees. Organizations should make sure to engage all employees in conversations around flex time, and to publicize that flex programs are available and their use is encouraged by all. We’re at a turning point with mobile technology. For many users, tablets and smartphones are no longer a convenience or entertainment tool, but a necessary part of their working lives. A recent survey by Aruba Networks identifies these users as “generation mobile.” The research, conducted to take stock of mobility’s increasing prominence in people’s working lives, examines survey responses from over 5,000 members of the public across the USA, UK, France, Spain, Germany, Sweden, South Africa, Saudi Arabia and UAE. Several characteristics define “generation mobile,” including believing in working anytime and anywhere, and in a more connected world (from cars to clothing). And while 18-35 year olds do account for the highest mobile users, generation mobile spans all age groups. Aruba Network’s research found that 86% of respondents owned at least two connected devices (devices with the ability to connect to the internet). Non-traditional working hours and the option of flextime were also identified as highly important values to generation mobile people. It should be noted though, that while the ability to hop on Wi-Fi and access work related materials during non-traditional work hours appeal to gen mobile, this value is not driven by laziness (45% of respondents report that they work most efficiently before 9am and after 6pm). Additionally, over half of those surveyed said they’d prefer to work from home or remotely two to three days a week than receive a 10% higher salary. This indicates that instituting flexible scheduling could not only increase productivity for employees and create a happier culture, but could be an opportunity for companies to create cost savings. Across the globe we see this move towards flexible work arrangements being reflected, with working out of office on the rise, and 37% of respondents expecting this trend to continue (with just 4.5% foreseeing a decrease). How vital is your mobility? 64% of respondents report that their mobile devices make them more productive at work, and 63% (over two-thirds) think their mobile devices help them manage their lives better. Looking just at hours spent, mobile devices play a huge role in people’s daily lives: 1/3 of us spend over 1/3 of our day on these devices, and while people still value ‘disconnected’ time (63%), such devices are obviously valuable to us – I’d wager you’ve felt the sting of forgetting one of these devices before. Why, as an organization, is it important to recognize the expectations and values of this generation mobile group? Despite the fact that this group is only likely to get bigger as we continue along in this uber-connected world, as I’ve discussed in other posts, understanding the values and motivators of your employees – and conveying that you value these too, is a huge part of building a great place to work. Employers should know that 28.9% (over a quarter of those surveyed in Aruba Network’s research), feel it is their company’s responsibility to provide them with a smartphone or a tablet. Furthermore, 29.2% report that though they would rather buy their own, they see these devices as a workplace necessity. It’s also important to note that the overwhelming majority of respondents want Wi-Fi over wired connectivity. This raises though, an important concern for employers. Organizations should make sure networks are secure and that the correct security measures are in place for employees storing company information on mobile devices. How #genmobile is your workforce? In the quest to retain talent, do you account for these kinds of expectations? Have you spent any time thinking about how important mobile devices are to you and those around you – a little? a lot? And have you used this insight to avoid the assumption that mobile devices and the high mobility they provide are only valued by younger, millennial employees? Turns out #GenMobile is a state of mind, not a function of age. SHRM and the Families and Work Institute have recently released their 2014 National Study of Employers (NSE), which identifies changes in the workplace since 2008. The report sample includes 1,051 employers with 50 or more employees, with 67% of these organizations for-profit employers and 33% are nonprofit organizations. 39% operate at only one location, while 61% percent have operations at more than one location. A pretty big sample. And the trends are interesting. Some make sense. And some, well, not so much. Workplace flexibility is top of mind for many business leaders, and the 2014 National Study of Employers notes two major trends between 2008 and 2014 related to this. First, employers have continued to increase the amount of options that allow at least some employees to better manage the times and places in which they work, including occasional flex place (from 50% to 67%); control over breaks (84% to 92%); control over overtime hours (27% to 45%) and time off during the workday when important needs arise (73% to 82%). Second, employers have reduced the amount of programs that give employees the opportunity to spend significant amounts of time away from full-time work. These include sharing jobs (29% to 18%), working part year on an annual basis (27% to 18%), and flex career options like sabbaticals (38% to 28%) and career breaks for personal or family responsibilities (from 64% to 52%). So, yes to more control over place and time while working and no to opportunities to not work. What support programs then, are workplaces increasing for employees? Employers are increasingly helping employees with elder care, with employers in 2014 12% more likely to report that they offer Elder Care Resource and Referral than employers in 2008. Employers are also 18% more likely in 2014 than 2008 to offer DCAPs (Dependent Care Assistance Programs) for elder care and 4% more likely to offer access to respite care. Wellness programs are also increasing, with 60% of workplaces providing wellness programs today (compared to 51% in 2008). SHRM and the Families and Work Institute’s report also noted an increase in the amount of workplaces providing Employee Assistance Programs to help with personal/family problems and pressures (78% now, compared with 58% in 2008). When it comes to healthcare, 98% of employers provide personal health insurance for full-time employees, a 3% increase from 2008. Additionally, there has been a 6% increase in employers providing more health care coverage for family members of full-time employees from 2008 to 2014 (91% to 97%), and a huge increase between 2008 and 2014 in the amount of employers providing health insurance for domestic partners (29% to 43%). Lastly, almost all employers (96% of those with 50+ employees) provide 401(k) or 403(b) retirement plans, and 80% of employers make contributions to employees’ individual retirement plans. According to the 2013 Better Life Index by OECD (the Organization for Economic Co-Operation and Development) we’re still fighting the battle to find balance between work and our personal lives. Out of the 36 countries ranked on the 2013 Better Life Index the United States came in at 28 for work-life balance, behind almost all the countries in Europe as well as Brazil, New Zealand, and Canada. Australia fell just behind the U.S at 29. The top three countries for work like balance were Denmark at #1, the Netherlands at #2, and Norway at #3. What’s the reason for the U.S ranking so poorly when it came to work-life balance? Perhaps the most obvious factor is one we are probably very familiar with hearing about – American’s work long hours! According to the Index, 11.13% of employees work “very long hours” each week, or fifty plus hours on average. This percentage has held fairly steady since 2004 save a minute decrease (the study ranks the average annual increase since 2004 at -0.4%). For comparison purposes, approximately 9.7% of people in all other countries reported working “very long hours” and in Denmark the percentage of employees working very long hours each week was only 1.97%. There are other influencers to the United States’ ranking when it comes to work-life balance. Gender roles still heavily influence the distribution of tasks within the family, with women spending an average of 4.3 hours a day on domestic work where men spend only 2.2 hours a day. Additionally, Americans devote less time to leisure and personal care than the OECD average; likely due to the simple fact that the more people work the less time they have to spend on other activities. Sadly, the U.S is the only OECD country without a national paid parental leave policy. The study explains that though total public spending on child welfare and education in the U.S is above the OECD average, most of this money is spent later in a child’s life (on public compulsory education). This reflects that early investment in childcare and support for families during and after pregnancy could have a greater focus. Though increasing parental leave policies would raise employers’ costs, evidence shows that women who take the full leave they are offered are more likely to return to work than women who do not, an incentive for employers to increase leave policies. OECD reports that female employment in the U.S has been falling over the last decade, despite the U.S having better career opportunities for women than most other OECD countries. Overall, compared to most other countries on the 2013 Better Life Index, Americans work longer hours, spend less time on leisure and personal care, and take less vacation days. How’s that working for your business? How’s that working for you?